These are the words of Derk Stegeman, one of the organisers of a “non-stop church service” in the Hague, which ended after 96 days this week. The service – which started in October last year – was organised because Dutch law prevents the police from interrupting church services, meaning the service could become a haven for the Tamrazyan family, originally from Armenia, who had sought asylum in the Netherlands. As Patrick Kingsley writes in the New York Times, pastors from across Europe came to take part in the service, and more than 250,000 people signed a petition calling for a “Children’s Pardon”. The church decided that the service could be safely ended this week following an agreement between the ruling parties of the Netherlands’ governing coalition. The provisional agreement means that around 700 families who are facing deportation despite having lived in the Netherlands for many years – could have their cases reassessed. government and protecting the rights of a child”. Communities of worship and places of worship have a notable history of providing sanctuary. The word “sanctuary” itself is of course a synonym for asylum, and describes an area of the church where people used to be able to go to be immune from arrest. Last year, more than 1,100 mosques, synagogues and churches had signed up to be part of the Sanctuary Movement in the United States, offering protection to undocumented migrants. This latest iteration echoes the move in the 1980s by hundreds of congregations, to offer shelter to Central American refugees. You can listen to a great podcast on this subject here. The sanctuary movement draws on a long past of protection, including providing refuge for religious minorities in the eighteenth century, assisting slaves in the south of the United States in the nineteenth century, and more recently Jews and other flee the Nazi regime in the 1930s. Quakers in Britain explicitly reference this past in their Sanctuary Everywhere manifesto. Immigration and Customs Enforcement (ICE) in the United States regards places of worship as “sensitive locations” (a category that also includes schools and hospitals” and says that while they can initiate immigration enforcement actions in such places, this is in “limited circumstances” and “will generally be avoided”. The Home Office in the UK doesn’t seem to share this idea of “sensitive locations”, having been known to embed staff in places of worship, and, in this example, breaking down the door of a mosque with a battering ram. In a time of rising xenophobia, racism and anti-migrant politics, the ties that bind to us to our fellow humans are more important than ever. 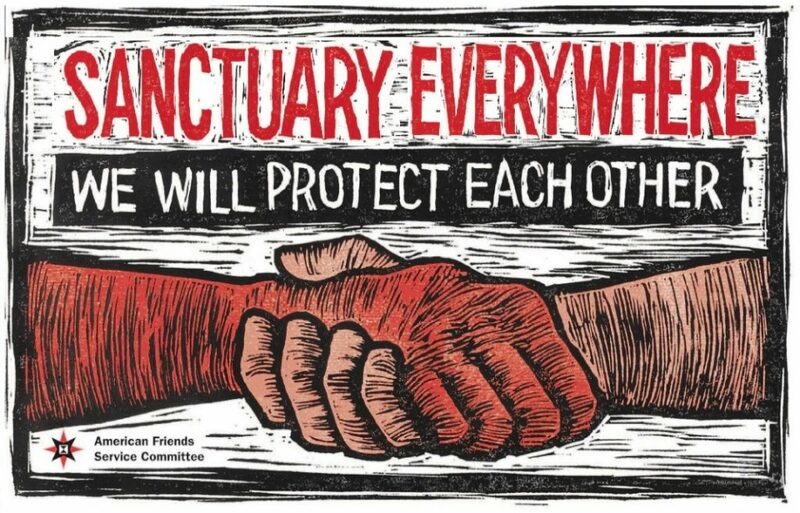 Sanctuary in action means ordinary people speaking up, speaking out, and doing something meaningful to protect individuals and show that these politics, these policies, these hate-mongers don’t represent us. That can involve defending members of our community, and trying to change government policy (such as these faith leaders speaking out against immigration detention). We may need MPs and civil servants to change law and policy – but change comes from us.